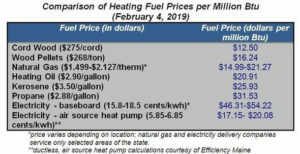 The Governor's Energy Office (GEO) conducted its weekly heating fuel price survey on Monday, Jan. 7, and found the current statewide average cash price for No. 2 heating oil was $2.86 per gallon, down 9 cents in the last three weeks. 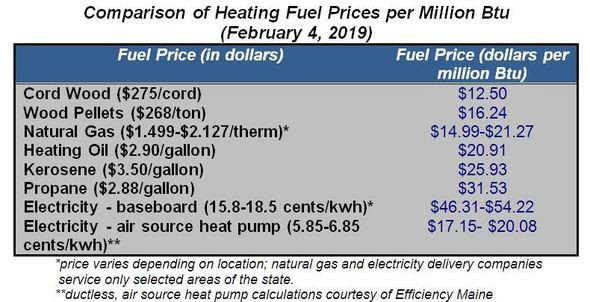 AUGUSTA, Maine — The Governor’s Energy Office (GEO) conducted its weekly heating fuel price survey on Monday, Jan. 7, and found the current statewide average cash price for No. 2 heating oil was $2.86 per gallon, down 9 cents in the last three weeks. The average statewide kerosene price has also dropped 9 cents, and now stands at $3.45 per gallon. The average propane price (for heating customers) this week has dipped to $2.87 per gallon, just below the $2.88 or $2.89 per gallon statewide price that has held steady since late October. Crude oil prices dropped almost 40 percent from early October into December, and have since recovered slightly; prices are now approximately 30 percent lower than early October highs (approximately $52 [WTI] to $61 [Brent] per barrel). Despite this, heating oil prices have continued a slow decline over the last few weeks. Crude oil prices are a significant factor contributing to the final price of heating oil, but weather also plays a large role. Heating Degree Days (HDD), a measure of heating demand, tell the story over the last couple of months. As the table below illustrates, heating demand in October and November was significantly higher than last year, and also higher than the 30-year normal calculated by the National Oceanic and Atmospheric Administration (NOAA). October was approximately 50 percent colder than a year ago. In contrast, December was warmer than last year, and very close to the 30-year average. Higher demand often results in higher prices, and lower demand, the opposite. Until the last few weeks, heating demand has been a factor contributing to flat retail prices in the face of lower crude oil costs. With the warm December, retail prices have begun to decline. Another factor contributing to the slow decline in retail prices is tighter domestic supplies. According to the Energy Information Administration, U.S. distillate inventories (including heating oil) have regained a bit of ground from mid-December, and are no longer below the five-year average. That being said, inventories are still at the bottom of the five year range for this time of year. Other states in the region are experiencing similar trends. Below is a chart that shows average statewide prices for heating oil and propane in the Northeast states. Average prices are determined using a population-weighted sample of retailers in each state. (Governor’s Energy Office)*price varies depending on location; natural gas and electricity delivery companies service only selected areas of the state. Fuel prices are only part of the calculation when determining which fuel will save you more money over the course of a heating season. The type of heating system and its efficiency are also important factors in determining final costs. The Energy Office has a home heating calculator on its website, http://www.maine.gov/energy/index.html . Efficiency Maine also has a calculator on its website to help consumers evaluate their heating options: http://www.efficiencymaine.com/at-home/home-energy-savings-program/heating-cost-comparison/ . The price for heating oil is a statewide average; prices in a given geographic region of the state may be considerably higher or lower than this average. This week, within the Energy Office sample, the highest heating oil price found was $3.35, and the lowest heating oil price found was $2.49. In addition, the statewide average price for propane is based on consumption of at least 900 gallons a year. Households using propane just for cooking or hot water generally pay a higher per-gallon price.